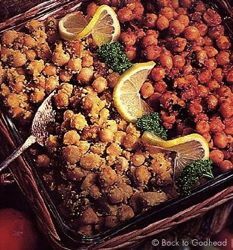 Savory Chickpeas in Tomato Glaze: out of this world. In this material world, all living beings are part of a food chain; one is food for another. Of all the links in that chain, humans uniquely have the developed consciousness required to question life's purpose, explore life's spiritual dimension, make educated moral and ethical choices, conduct research into the existence of a Supreme Being, and to make menu choices based on considerations beyond hunger and taste preference. Traditional spiritual wisdom supports the view that higher intelligence carries with it a greater degree of responsibility. Vedic teachings especially say that human beings' eating habits are uniquely subject to laws of karma, right and wrong. This is why human societies generally set guidelines for what can and can't be eaten. Most genuine spiritual traditions also recommend making offerings of food in gratitude—sacrifice—to the natural and supernatural forces giving us life. For example, those following the path of Krishna-bhakti, approaching the Supreme Person in the mood of devotional service, offer their food to the Supreme Person before eating. Krishna says in the Bhagavad-gita that if we eat things that haven't been offered in sacrifice, we're liable to be punished for eating other living beings. But He also says that offering everything we eat to the Supreme Person—Krishna Himself—frees us from karmic reaction. Such offerings need not be elaborate or costly; Krishna accepts even a leaf, a fruit, a flower, and water if offered with love. Krishna categorizes meat, fish and eggs in the mode of ignorance—not meant for human consumption—so they are never to be offered to Krishna. The vegetarianism of Krishna's devotees is a by-product of their spiritual commitment; their goal isn't to avoid meat but to please Krishna. They take vows to avoid eating meat, fish and eggs not only because such things aren't offerable to Krishna, but eating them also severely diminishes one's capacity for mercy and for perceiving spiritual reality. Scriptures like the Srimad-Bhagavatam and Chaitanya Charitamrita contain descriptions of some of the many wonderful dishes Krishna's devotees offer Him, and cooks in Krishna temples today strive to prepare the finest offerings for Krishna's pleasure based on such writings. Cooking is one of the most essential devotional arts of the Krishna-bhakti tradition, and many who have tasted such extraordinary devotional cooking credit that dining experience with inspiring them to pursue a more spiritual lifestyle. Krishna devotees maintain high standards in cooking. They prepare and offer meals to Krishna, with gratitude and affection, and eat only after the offering ceremony is complete. Food offered to Krishna becomes spiritualized by Krishna's glance, and is then called prasadam, the "mercy of God." The food we eat replenishes our body's cells, so on a purely physical level we literally are what we eat. And the quality of consciousness with which our food is prepared affects us in deeper ways. Those who only eat Krishna-prasadam are freed from all karma and get profound spiritual benefit. - Is it possible to live on food that's natural, healthy, nonviolent, and cheap? And tastes great? - why vegetarianism is not enough. - an intro covering some basic procedures and hints. A Leaf, A Fruit, A Flower, Part II - Vegetarians are just self-righteous vegetable-killers, some people say. - a dialogue between the Biblical and Vaishnava traditions on Vegetarianism. - who's to say what's really "good" or "bad" for us? A Diet for Spiritual Health- a mother shares her thoughts on the benefits of a "prasadam-only" diet. - vegetarian cookbooks with recipes from around the world and tips on how to cook for Krishna. ". . .although the law states that a human being must subsist on another living being, there is the law of good sense also, for the human being is meant to obey the laws of the scriptures. This is impossible for other animals. The human being is meant for self-realization, and for that purpose he is not to eat anything which is not first offered to the Lord. The Lord accepts from His devotee all kinds of food preparations made of vegetables, fruits, leaves and grains. Fruits, leaves and milk in different varieties can be offered to the Lord, and after the Lord accepts the foodstuff, the devotee can partake of the prasada, by which all suffering in the struggle for existence will be gradually mitigated. This is confirmed in the Bhagavad-gita ( 9.26)." "The devotees of the Lord are released from all kinds of sins because they eat food which is offered ﬁrst for sacriﬁce. Others, who prepare food for personal sense enjoyment, verily eat only sin." "If one offers Me with love and devotion a leaf, a flower, fruit or water, I will accept it." "One who loves Krishna will give Him whatever He wants, and he avoids offering anything which is undesirable or unasked. Thus meat, fish and eggs should not be offered to Krishna. If He desired such things as offerings, He would have said so. Instead He clearly requests that a leaf, fruit, flowers and water be given to Him, and He says of this offering, 'I will accept it.' Therefore, we should understand that He will not accept meat, fish and eggs. Vegetables, grains, fruits, milk and water are the proper foods for human beings and are prescribed by Lord Krishna Himself. Whatever else we eat cannot be offered to Him, since He will not accept it. Thus we cannot be acting on the level of loving devotion if we offer such foods." "There is no need for men to eat animals, because there is an ample supply of grains, vegetables, fruits and milk. Such simple foodstuff is considered to be in the mode of goodness according to the Bhagavad-gita. Animal food is for those in the mode of ignorance. Therefore, those who indulge in animal food, drinking, smoking and eating food which is not ﬁrst offered to Krishna will suffer sinful reactions because of eating only polluted things." ". . .It is stated in the Tenth Canto of Srimad-Bhagavatam that one who is addicted to meat-eating cannot understand the pastimes of Lord Krishna. By cultivation of the material mode of goodness, however, one may become a vegetarian and perhaps come to appreciate the sublime process of Krishna consciousness." "The purpose of food is to increase the duration of life, purify the mind and aid bodily strength. This is its only purpose. In the past, great authorities selected those foods that best aid health and increase life’s duration, such as milk products, sugar, rice, wheat, fruits and vegetables. . . All these foods are pure by nature. They are quite distinct from untouchable things like meat and liquor. . . Animal fat is available in the form of milk, which is the most wonderful of all foods. Milk, butter, cheese and similar products give animal fat in a form which rules out any need for the killing of innocent creatures. It is only through brute mentality that this killing goes on. The civilized method of obtaining needed fat is by milk. Slaughter is the way of subhumans. Protein is amply available through split peas, dāl, whole wheat, etc." "In the Brahma-samhita it is said that the Lord has a transcendental form and that He can utilize any one of His senses for any purpose. For example, He can eat with His eyes, and He can see with His leg. In the mundane conception of form, one cannot eat with one's eyes or see with his leg. That is the difference between the mundane body and the spiritual body of sac-cid-ananda [ Bs. 5.1]." "First, three mānas of cooked rice — almost six pounds — was poured onto a big banana leaf. Then the whole stack of rice was mixed with so much yellowish and fragrant clarified butter that it began to overflow the leaf. There were a number of pots made of the bark of banana trees and the leaves of the keyā plant. These pots were filled with various cooked vegetables and placed on all sides of the leaf. There were about ten kinds of spinach, a soup called sukhta, which was made with bitter nimba leaves, a pungent preparation made with black pepper, a mild cake made of fried curd, and buttermilk mixed with small fried pieces of dhal. There were preparations of dugdha-tumbī, dugdha-kuṣmāṇḍa, vesara, lāphrā, mocā-ghaṇṭa, mocā-bhājā and other vegetables. There were unlimited quantities of vṛddha-kuṣmāṇḍa-baḍī, phula-baḍī, fruits and various roots. Other preparations included eggplant mixed with newly grown nimba leaves fried together, light baḍī, fried paṭola and fried rounds of squash and pumpkin. There was a soup made with fried urad dhal and mung dhal, defeating nectar. There were also sweet chutney and five or six kinds of sour preparations, beginning with baḍāmla. There were baḍās made of mung dhal, of urad dhal and of sweet bananas, and there were sweet-rice cakes, coconut cakes and various other cakes. There were kāṅji-baḍā, dugdha-ciḍā, dugdha-laklakī and various cakes that I am unable to describe. Sweet rice mixed with ghee was poured into an earthen pot and mixed with cāṅpā-kalā, condensed milk and mango. Other preparations included a very delicious churned curd and a variety of sandeśa sweetmeats. Indeed, all the various eatables available in Bengal and Orissa were prepared. Thus the Bhaṭṭācārya prepared a great variety of food and spread a fine cloth over a white wooden platform. On two sides of the stack of food were pitchers filled with scented cold water. The flowers of the tulasī tree were placed atop the mound of rice. Sārvabhauma Bhaṭṭācārya also included several types of food that had been offered to Lord Jagannātha. These included sweetballs known as amṛta-guṭikā, sweet rice and cakes. All these were kept separate. When everything was ready, Śrī Chaitanya Mahāprabhu came there alone after finishing His midday duties. He knew the heart of Sārvabhauma Bhaṭṭācārya. After Sārvabhauma Bhaṭṭācārya washed the Lord’s feet, the Lord entered the room to take His lunch." I've heard you can't offer Krishna garlic or onions. Why not? Can you offer Krishna mushrooms? Can I offer celery to Krishna?